This week started with chainsaw practice. I took my newly purchased chainsaw down to the yard and was supplied with the proper safety equipment. We went through chainsaw maintenance, checking the chain tension, checking the cutting blades are sharp and filing down the guides that ensure the chain does not bite too deep when cutting. We checked the chain oil and 2 stroke fuel mix and then covered proper starting technique. There are two ways you can safely start the saw, one is on the ground with a foot on the main handle, the other is with the handle locked between your knees. It is important to hold the top handle of the saw with your left hand when starting to avoid changing hands once the saw is running. The choke is set and then the pull-start used to start the saw. Once the saw is running and warmed up the choke can be closed off. The next thing to do is test the chain brake, this is done by running the saw up to full revs so the chain is spinning at full speed and then applying the chain brake, the chain should lock immediately. The next test is to run the saw whilst holding it over a light coloured surface and make sure there is a fine spray of chain oil coming form the chain, this ensures that the oil feed is working and the chain is properly lubricated. If the chain is not being lubricated this can lead to it running hot and eventually breaking, with serious consequences. 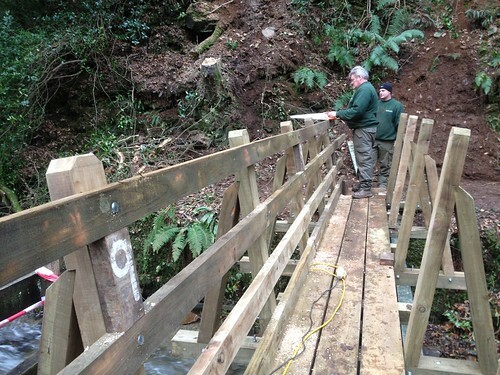 Once all the safety checks have been carried out the saw can then be used. With all safety equipment on and under supervision, I set about making the first few cuts to an old log in the timber yard. The log had a small branch sticking off (about 4 inch diameter) which was ideal for the first few test cuts. 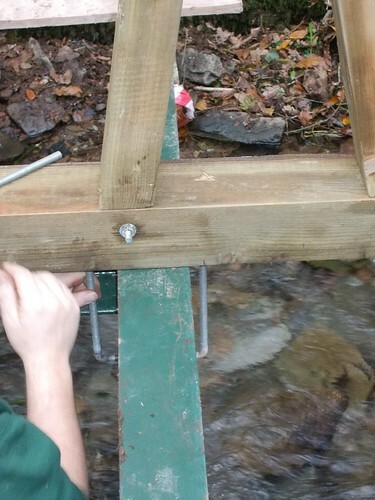 It is important to use the section of the chain on the bottom of the bar, with the saw body as close as possible to the timber being cut. 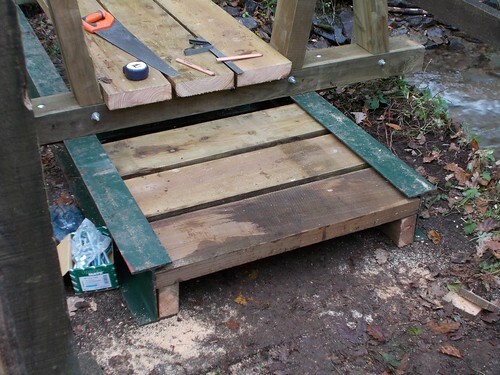 It is important to rest the saw against your leg whilst ensuring you lean slightly back and away from the saw, this helps to ensure that the saw is well supported, but your body and face are away from the saw in case it kicks back. Maintaining a firm grip on the saw is important as when it starts to cut it will inevitably pull a little. Once I had the feel for this we discussed the various ways to tackle different angles and cuts on the log and took off some of the stumps from the main body of the log, using the saw carefully to remove them. We also discussed how you need to maintain the shape of the main body of the tree as if you cut into the heartwood area the logs won’t be worth as much money. We also discussed how a 14″ saw can be used to fell trees that are nearly 3 times the size of the bar on the saw (42″) by using several cuts. The first cut is the felling notch (which determines which way the tree will fall) the second cut is plunged into the trunk on the opposite side of the trunk and then the saw is worked left to right to create a large, open area inside. Finally the saw is removed and run around the back of the trunk away from the felling notch which relieves the remaining wood and causes the tree to fall in the direction of the felling notch. We discussed under-cutting using the top section of the chain and how much more dangerous this is, the saw is more likely to kick back, and there is the tip section (about 4″-5″ from the tip of the saw on the top edge) which should be avoided for cutting with as it is the most likely to cause dangerous kick-back. 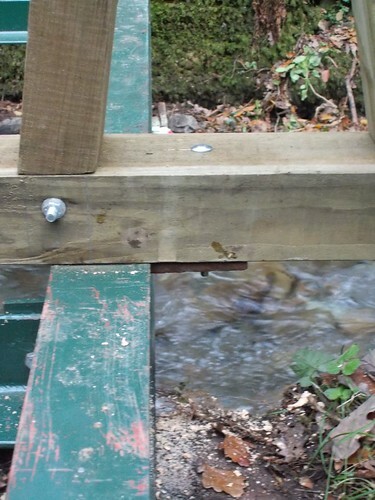 It is often useful to undercut a log if it is resting across two supports as there will be tension in the underside of the log which can cause the saw to become trapped when cutting from the topside of the log down, by watching the log carefully you can cut down and as you start to see the gap closing, remove the saw and then cut from the underside upwards to meet the cut you have already made. It is important when undercutting to keep the saw as close to the log as possible and keep a very firm grip on the saw as it will try to push back towards you and this could lead to kick-back. I tried a few of these cuts successfully. Then we tried cutting a log that was thicker than the chainsaw bar. 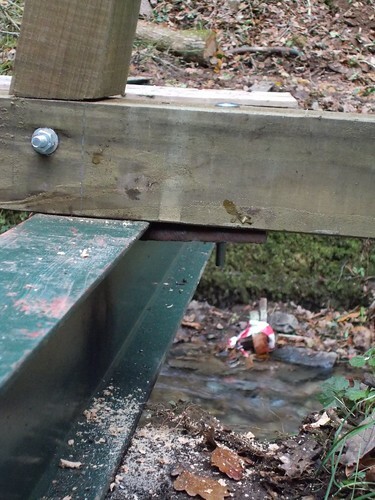 To do this you cut down and into the log as deep as the saw will go and work your way around, again using the timber spike as a lever and keeping the saw body as close to the log as possible. 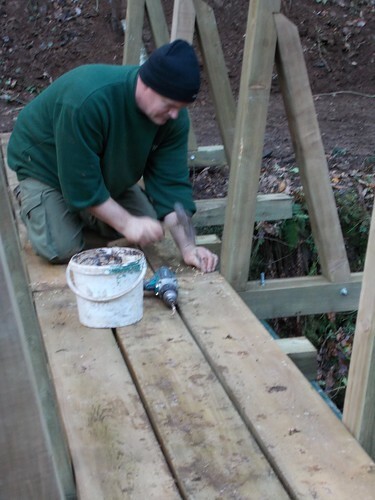 Once the cut has gone as far round as possible, the chain brake is applied and you move to the other side of the log and finish the cut from there, taking out the last piece of wood holding the log together. It is very important to apply the chain brake before moving your feet as this reduces the risk of the chain accidentally running whilst you are moving and not paying as much attention to the chain. When carrying the saw, it is important to carry it with the chain bar sticking out behind you, this reduces the risk of the saw swinging and the chain hitting the operator. 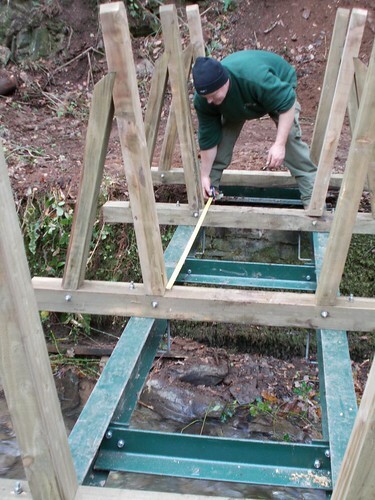 With the saw switched off, the chain cover should always be in place whilst carrying the saw. 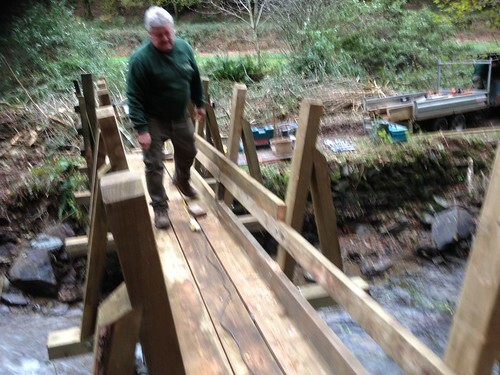 The main job today was to fit a bridge over a river. 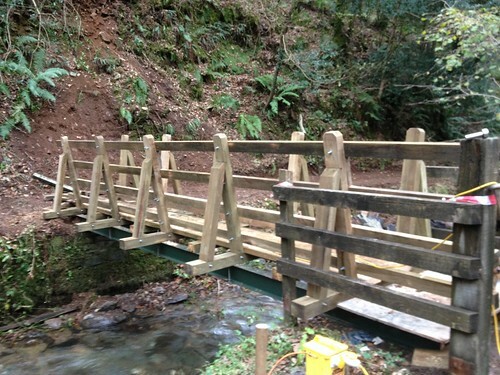 The old bridge had been destroyed by a falling tree and had been removed previously. We loaded up all the tools and timber that would be required for the days work and set out to site. 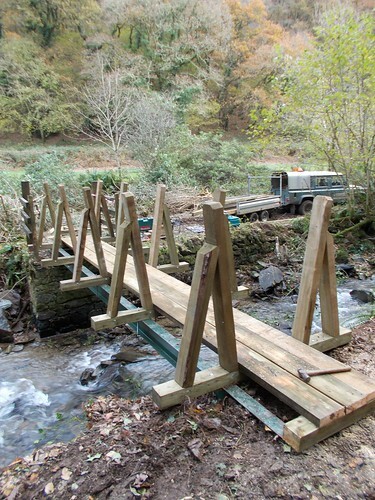 Over the previous few days the old bridge had been cleared away and the steel girders to hold the new bridge had been put in place. 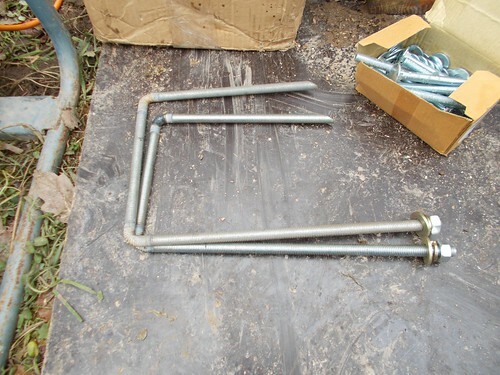 The stanchions has been assembled and sent away for pressure treating to ensure the wood will not rot. 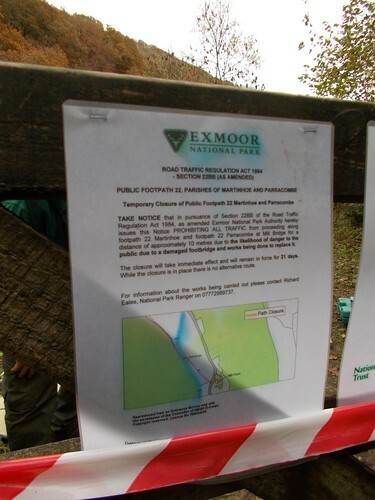 A notice had been put up which quoted the legal statute that allows the National Park to close the footpath for reasons of public safety. 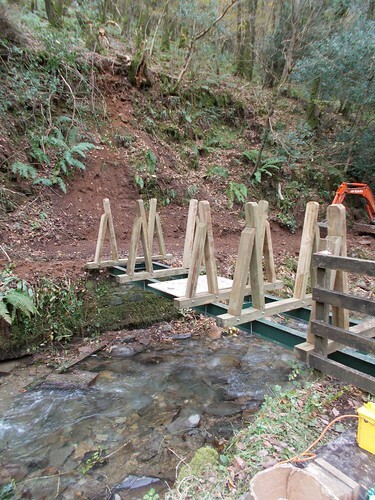 The first job was to position the stanchions and clamp them to the girders, this is done using one of two methods. 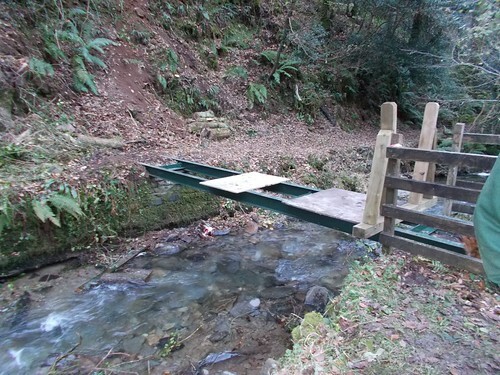 The original method was to use a steel plate with a hole drilled in it which is bolted to the underside of the stanchion and then clamped to the girder. The other method uses a section of threaded bar that has been formed into a square section that will fit around the girder. 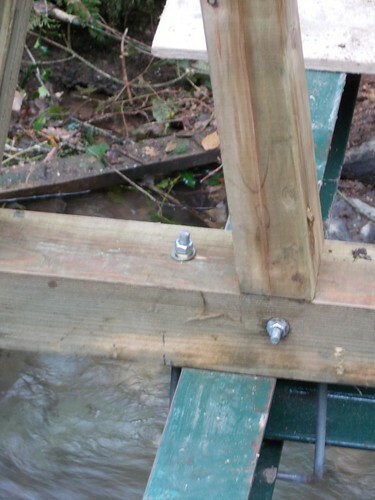 One end of this bar is cut at an angle to provide a sharp point which can be hammered into the wood of the stanchion. 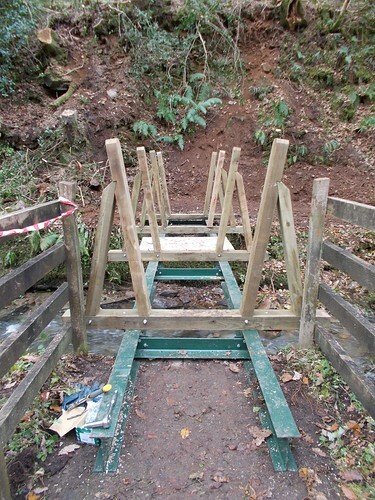 The full length of the bridge is measured and a bit of maths employed to work out the spacings of the stanchions, the gaps are then measured and the stanchions spaced out accordingly. The next job is to check all the spacings again and then tighten all the bolts on the clamps that hold the stanchions to the girders. 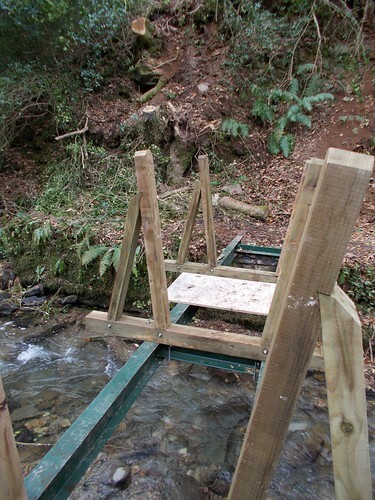 This ensures they stay put and provide a strong structure for the bridge. 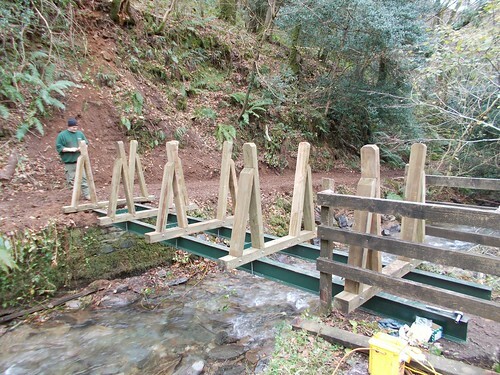 Once all the stanchions are secured, planks of 2″x6″ board are placed to make the base for the bridge. 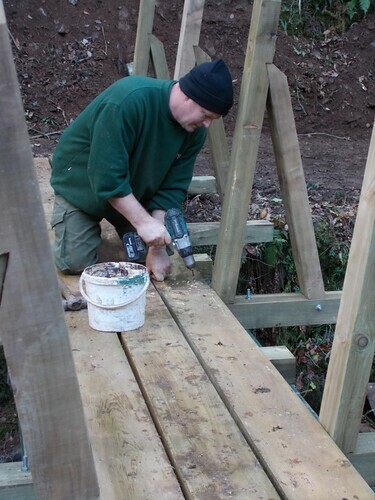 Once the boards are in place we set about drilling them and nailing them down. 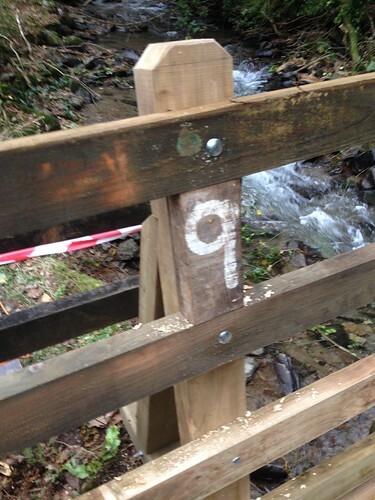 Extra sections of 8″x4″ timber are set at equal distances between the stanchions to provide extra strength to the bride, the boards are nailed to these and to the stanchions. 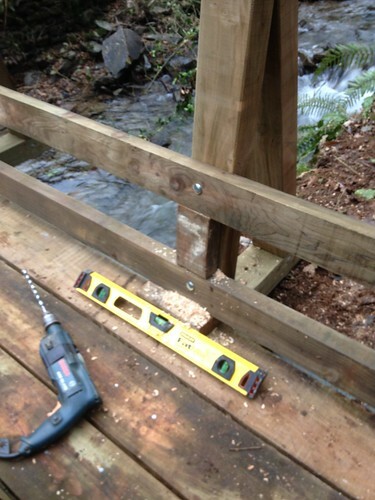 The cordless drill is used to drill through the board, but not the timber underneath. This makes it easier to drive the nails in and ensures the are driven in at the correct angle. 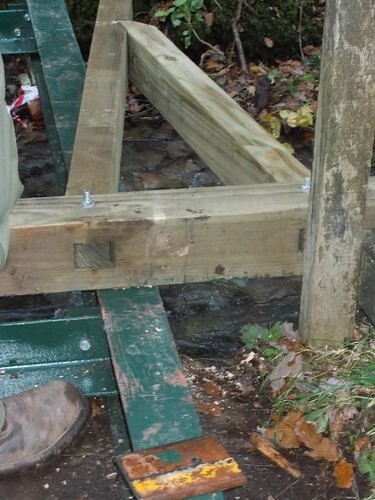 The next job is to fit the rails, this is done using timber that has been cut to specific lengths to space the rails from each other. This makes the job easier as the rails can rest on these spacers whilst they are drilled and fitted with nuts, washers and bolts. 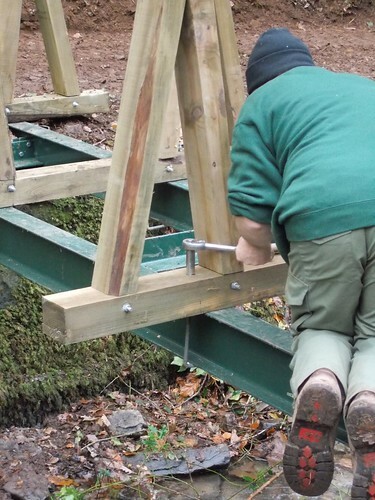 A spirit level is used to make sure the stanchions are exactly upright before they are bolted, this ensures the bridge will look “square”. 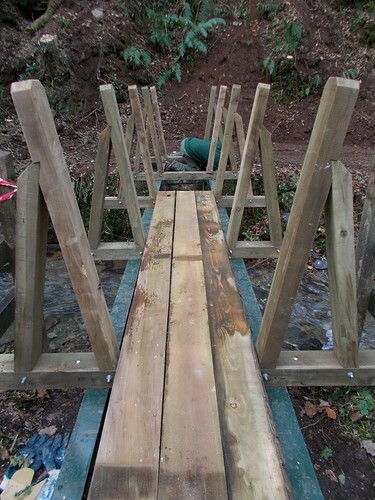 The rails are also staggered to provide greater strength to the bridge. 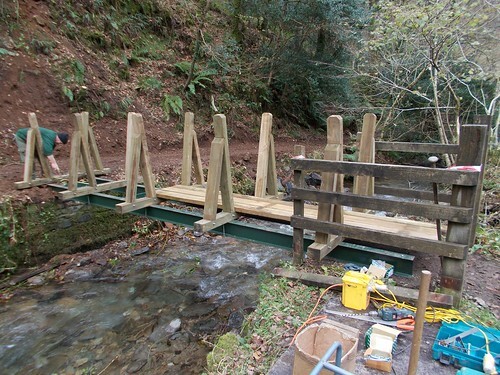 We didn’t quite finish the job, but I will be heading back at some point to take a few pictures of the finished bridge. 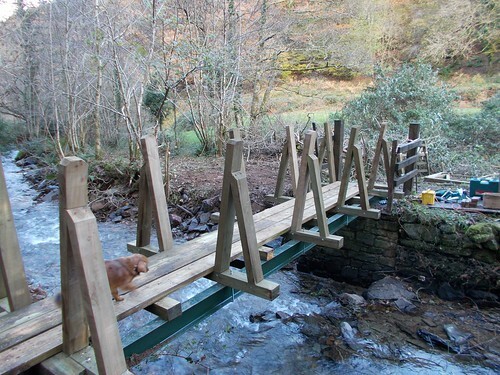 We did make sure all signage was back in place before leaving to ensure people did not try to use the bridge until it was finished. still remember when I was just finished with my degree, after a while on the dole I was asked what course I would like to do…. having a degree in environmental science, I suggested a chainsaw course, they seemed to forget that Bromley was the most heavily wooded borough in London at the time.